"I was worried for a suspected lung nodule on a recently-performed thoracic X-ray of my mother-in-law. The second opinion of Dr. Argentieri was detailed and easily understandable. Dr. Argentieri clearly discussed the nature of this radiographic alteration, which seems to be as of normal finding in people of her age, differently from what it was stated in the original report of the exam. Moreover, he also described an esophageal finding which helped my mother-in-law focusing and understanding some complaints she was experiencing since the last few months. Then, he gave her many pieces of advice in order to further explore this finding. I strongly recommend Dr. Argentieri for a second opinion. Thank you, Dr. Argentieri! " I have international European experience: medical degree at "La Sapienza" University in Rome, specialty training at the prestigious King's College Hospital of London, and fellowship at Hôpital Calmette - University Center in Lille, France. 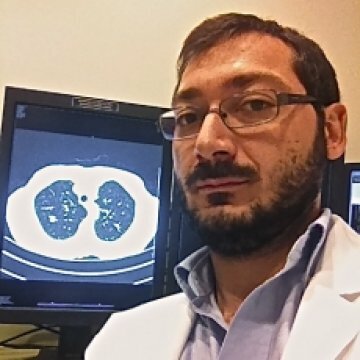 Currently, I am the referent Cardio-Thoracic Radiologist in Ticino, Switzerland. My main focus is oncology, gastro-intestinal, urogenital and trauma radiology, but I have experience in all radiology modalities. Thanks for your quick answer. I will follow your advice to go under gastroscopie and I will give you feedback . The report was delivered very quickly - within 24 hours. The reporting itself is very informative and logical - much more informative than the original first opinion. Additionally, further actions for my condition were advised. Overall, I can highly recommend Dr. Argentieri for the second opinion. Very prompt service provided. Format of including pictures of scan is helpful for layperson to understand. I have not followed up yet on the recommended action (colonscopy) but even knowing the possibility of a redundant colon will be helpful for discussions planned with Dr. of Naturopathy. Thank you very much. I want to thank Dr. Argentieri for his prompt review and diagnosis. A very efficient and great service, providing additional insight into my existing CT Scan results. Dr. Argentieri provided a great report just in one day as it was urgent case. Quality of report is excellent, extra images and explanations were added. I can definitely recommend this doctor for second opinion. There report was excellent !!! Not only it was delivered within the agreed time, which I believe is important for anyone with health concerns. Furthermore I think that the price was also invaluable for the quality of the service that Dr. Argentieri delivered. I was very impressed. A second opinion was very important for me due to the debilitating nature of my illness and my clinical history of previous breast cancer. I have no words to thank enough Dr. Argentieri. I really recommend him to anyone who need a professional and precise answer. I asked Diagnose.me a second opinion about the imaging of my abdomen because I didn't understand what were the lesions on my liver and left kidney. I have thrombocytopenia and I didn't know if my spleen's dimensions were in the normal range. I think that my decision to choose Dr. Argentieri was great. In fact, the doctor was very precise on his diagnosis. He analyzed each of my pictures in detail.He was punctual in the delivery of medical report. Furthermore, he was very kind and available to help me. I recommend a medical opinion from Dr Gianluca Argentieri. I was worried for a suspected lung nodule on a recently-performed thoracic X-ray of my mother-in-law. The second opinion of Dr. Argentieri was detailed and easily understandable. Dr. Argentieri clearly discussed the nature of this radiographic alteration, which seems to be as of normal finding in people of her age, differently from what it was stated in the original report of the exam. Moreover, he also described an esophageal finding which helped my mother-in-law focusing and understanding some complaints she was experiencing since the last few months. Then, he gave her many pieces of advice in order to further explore this finding. I strongly recommend Dr. Argentieri for a second opinion. Thank you, Dr. Argentieri! I cannot thank you enough for your thorough report. I appreciate the detailed interpretation of the images and also the selection of the images with arrows pointing to the area that may need further investigation. This is very helpfu. I will use your recommendation for pursuing follow up investigations.I hope those studies are available here in Australia. The turnaround time and cost for the review are both exceptional I think. Please accept my thanks and gratitude for your help. Reply from Diagnose.me: Thank you very much for your feedback. Please note that you can ask your specialist for a follow-up questions. This is available directly from your account page.